Background and Aims: Spinal anesthesia is the preferred technique over general anesthesia in caesarean section. General anesthesia is still used for category-1 emergency caesarean section because of time constraints. We usually follow rapid sequence general anesthesia in obstetrics to avoid aspiration. However, this technique poses several problems. An approach of spinal anesthesia termed as rapid sequence spinal anesthesia has been described. The present study was designed to compare the time intervals (time for anesthesia, time to surgical readiness, incision to delivery time, emergence time) and Apgar score between rapid sequence spinal anesthesia and rapid sequence general anesthesia during category-1 caesarean section and to evaluate whether rapid sequence spinal anesthesia is a better option in category-1 caesarean section. Materials and Methods: In this prospective randomized study, 60 patients of American Society of Anesthesiologists physical status (ASA-PS) I posted for category-1 emergency caesarean section were randomly allocated into two equal groups and received either of the two techniques. Demographic data, respective time intervals, and Apgar scores were noted and compared. Results: The time for anesthesia, surgical readiness, and emergence were significantly longer (P < 0.001) in rapid sequence general anesthesia group as compared to rapid sequence spinal anesthesia group (144.80 ± 3.42 vs 131.20 ± 3.40 s, 178.76 ± 4.09 vs 169.93 ± 3.08 s, 512.13 ± 34.33 vs 222.10 ± 12.80 s). No significant difference was found in incision to delivery time and Apgar scores between the two groups. Conclusion: Because anesthesia to delivery time is shorter in rapid sequence spinal anesthesia, this technique may be equivalent to rapid sequence general anesthesia in category-1 emergency caesarean section. Termination of pregnancy by caesarean section (CS) is increasing all over the world. The four-point classification of urgency of CS used by the National Confidential Enquiry into Perioperative Deaths are: Category 1 – immediate threat to life of the woman or fetus, Category 2 – maternal or fetal compromise, not immediately life-threatening, Category 3 – need early delivery but no maternal or fetal compromise, Category 4 – at a time to suit the woman and maternity team. Spinal anesthesia (SA) has become the standard technique in category 2, 3, and 4 as it results in less maternal and neonatal morbidity than general anesthesia (GA) (Grade-A recommendation, NICE). 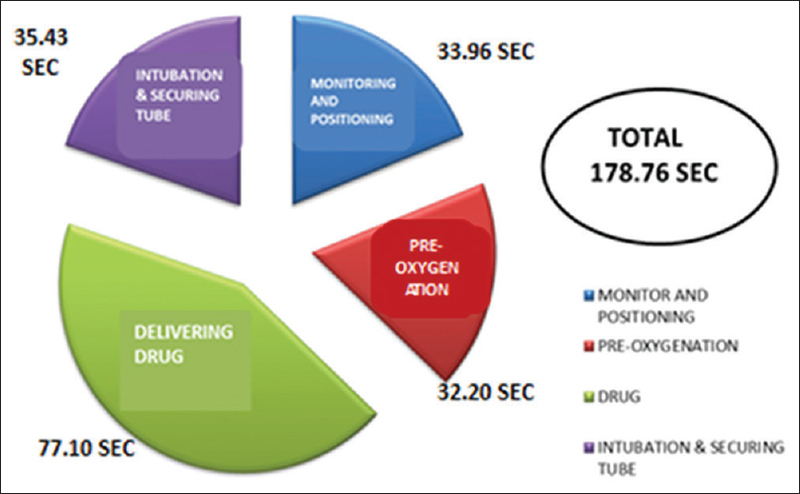 In category-1 CS, rapid sequence general anesthesia (RSGA) is commonly used because this technique is faster to perform than SA. However, RSGA is currently being challenged due to risk of hypoxia, aspiration, and controversies regarding the technique practiced, choice, and doses of drugs. If SA can be performed faster, it will become a more acceptable option in category-1 CS. A specific approach of spinal anesthesia called rapid sequence spinal anesthesia (RSSA) for category-1 obstetric cases has been described. The steps of RSSA include the use of a no-touch technique for spinal needle insertion, simplifying the spinal drug combination, limiting the permitted time available for attempts, if necessary starting the surgery before full establishment of the block and be ready to administer general anesthesia in the event of a spinal failure. In this study, we followed these steps and compared RSGA and RSSA regarding anesthesia time, time to surgical readiness, incision to delivery time, emergence time, and Apgar score, as well as to evaluate whether RSSA is a better option in category-1 caesarean sections. After obtaining institutional ethics committee approval and informed written consent from patients, this prospective, randomized study was performed. Sixty patients of American Society of Anesthesiologists physical status (ASA-PS) I selected for category-1 CS were included and randomly allocated into two equal groups, 30 in each group. Group A received RSGA and group B received RSSA. Those with known contraindications to SA such as maternal coagulopathy, hemodynamic instability, or having anticipated difficult intubation were excluded from this study. One experienced anesthesiologist performed either of the two techniques, and another person not involved in performing the procedures, recorded the Apgar scores and the following times: patient's arrival at operating room, start of anesthesia (start of pre-oxygenation in RSGA or back scrubbing in RSSA), induction time (confirmation of correct endotracheal tube placement in RSGA or adequate level of block by assessing loss of cold sensation in RSSA), skin incision, baby delivery, completion of surgery, and shifting from the operating room to the ward. The times were recorded according to the operating room wall clock. The time intervals [Box 1] were defined as time for anesthesia (from start of anesthesia to the completion of induction), time for surgical readiness (from arrival at the operating room to incision), incision to delivery time (from time of incision to delivery of baby), emergence time (from completion of surgery to shifting of patients from the operating room to ward). In RSGA (group A), patients were prepared and draped before the induction of anesthesia, and in RSSA (group B), patients were prepared and draped after the administration of block. To overcome the problem regarding time calculation, we considered the time for anesthesia (time from the start of anesthesia to completion of induction) and time to achieve surgical readiness (arrival to incision time) instead of the time for induction (arrival to completion of induction). After admission, intravenous (IV) cannulation was done and ringer lactate 10 ml/kg was started. Aspiration prophylaxis (Ranitidine 50 mg IV, Metoclopramide 10 mg IV) was administered. Continuous monitoring of vital parameters of the fetus and mother was done. As soon as the decision of CS was made, the anesthetic drug kit and difficult airway cart (either for GA or SA) was prepared and the anesthesiologist became ready by wearing sterile gloves and gown for administration of SA to reduce the time required for anesthesia and surgical readiness. This preoperative preparation part was designed similarly for both the study groups. In RSGA, induction was done with thiopental 5.0 mg/kg over 10–15 s after de-nitrogenation with 4 vital capacity breaths. Intubation was performed with succinylcholine 1.0 mg/kg. The cricoid pressure was applied as soon as patients lost consciousness, and it was continued until the correct position of the endotracheal tube was verified and the cuff was inflated. Left uterine displacement was performed by putting a wedge under the right buttock to prevent supine hypotension syndrome. Time intervals during the technique described above were calculated. RSSA was established with 26 G pencil point spinal needle in L3-L4 or one space below in a sitting position with 2.5 ml of hyperbaric bupivacaine (0.5%) without adjuvant after cleaning the skin with a single wipe of 0.5% chlorhexidine. Drug kit for SA was prepared aseptically, and the anesthesiologist who performed the procedure was ready with a sterile gown and gloves before the patients came to the operating room. The patient was placed in a Trendelenburg position with a head down tilt of 15° after the procedure. Times for different components of RSSA were recorded similarly. After administering spinal anesthesia, draping was done, and simultaneously the progression of the level of block was assessed aseptically by loss of cold sensation. When block height was achieved up to T10, surgeons started the procedure. Intraoperative heart rate, noninvasive blood pressure, electrocardiogram, oxygen saturation, and end tracheal carbon dioxide concentration were monitored. Apgar score  was noted at birth and 5 min after the delivery. Statistical analysis was done with the Statistical Package for the Social Sciences (SPSS) version 16. (SPSS Inc. Released 2007, SPSS for Windows, Version 16.0, Chicago, SPSS Inc.). The sample size was calculated by considering the mean difference between two groups as 7 min (σ), and according the previous study, the expected difference is 5 min (δ). Considering α error as 5% and β as error 20% [(Zα + Zβ) 2 × 2x σ2/δ2 ]), sample size was calculated to be 30. Numerical data analyzed with unpaired student t test. Any P value less than 0.05 was considered to be significant. Results were expressed as mean ± standard deviation (SD). Both the groups were comparable regarding their age (RSGA: 28.33 ± 2.35 vs. RSSA: 28.00 ± 3.28, P = 0.653), height (RSGA: 153.63 ± 4.64 vs. RSSA: 154.60 ± 5.47, P = 0.450), and weight (RSGA: 61.46 ± 4.38 vs RSSA: 61.50 ± 3.93, P = 0.975) [Table 1]. There was no incidence of block failure in the RSSA group. Hypotension (MAP ≤ 20% of baseline value) was observed among 6 patients in RSSA group (n = 30), which was corrected by intravenous phenylephrine 50 µg and repeated, if required. Bradycardia (HR ≤ 60 beats/min) and high spinal block were not observed in any patients of the RSSA group. In the present study, indications of category-1 CS were major hemorrhage, profound and persistent fetal bradycardia, prolapsed cord, shoulder dystocia, and uterine rupture [Table 2]. We achieved adequate block height in all patients of the RSSA group. Time for anesthesia was more in the RSGA group (144.80 ± 3.42) than the RSSA group (131.20 ± 3.40), which was statistically significant (P < 0.001) [Table 3]; [Figure 1]. The time for surgical readiness was also significantly higher in the RSGA group (178.76 ± 4.09) in comparison to the RSSA group (169.93 ± 3.08) with P value of < 0.001, which was statistically significant [Table 3]; [Figure 2]. 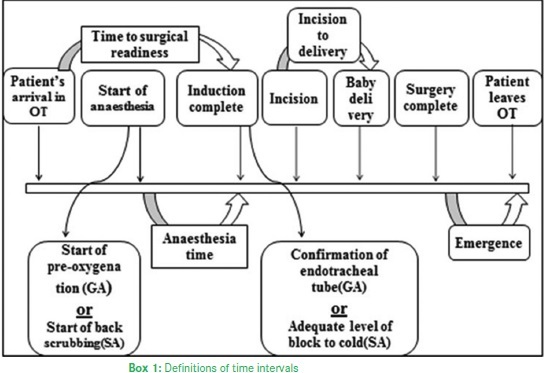 The divisions of times required for each of the four components of time for surgical readiness – both with RSGA and RSSA – is shown in [Figure 3] and [Figure 4], respectively. Incision to delivery time between both the groups was comparable [Table 3]; [Figure 5]. Emergence time between both the groups was also comparable, which was significantly higher in the RSGA group (512.13 ± 34.33) than the RSSA group (222.10 ± 12.80), with P value of <0.001 [Figure 6]. Apgar score recorded at 5 min after birth was comparable between both the groups (RSGA: 7.03 ± 1.99 vs. RSSA: 7.40 ± 1.83, P = 0.461) [Table 1]. Fever, tachycardia, neck rigidity, and altered consciousness were examined to rule out the incidence of meningitis and arachnoiditis in the postoperative period. An area of numbness or of “pins and needles,” weakness of muscles, paraplegia, and loss of control of bladder and bowel were also observed to exclude neurological injury. Patients were followed up for a week in the postoperative period, and no such complications were noted in any of these patients. The primary goal of anesthesia for caesarean section is to provide adequate and safe anesthesia both for the mother and baby. The rapidity of the anesthetic technique is not the sole factor but early decision making, shorter decision to delivery interval, and proper neonatal resuscitation are essential during emergency CS. SA is considered to be safe for parturients undergoing CS. However, more time is required to perform SA than GA. Hence, this technique is not preferred in category-1 CS. As obstetric patients are considered to be full stomach patients, rapid sequence induction and intubation is the traditional approach for CS. However, this traditional technique is currently being challenged due to various controversies  These controversies include the choice and dose of drug and the methods of administration, positive pressure ventilation before tracheal intubation, and role of cricoid pressure. Report on Confidential Enquiries into Maternal Deaths (2000-02) in the United Kingdom cited six deaths attributable to general anesthesia with esophageal intubation as a cause of mortality. GA is also associated with short-term neonatal morbidity of term babies born by category-1 CS, despite rapid delivery of the baby. In category-1 CS, standard recommendation is to maintain decision to delivery time within 30 min. This time interval not only depends on the time required for anesthesia and time for surgical readiness but also depends on the time required for transfer of the patient to the operating room after decision of emergency CS and the time gap between skin incision to baby delivery. A delay in any of these steps will lead to a prolongation of decision to delivery time irrespective of the anesthesia technique. Therefore, the present study was formulated to compare between anesthesia to delivery time instead of decision to delivery time. A faster SA procedure will have greater acceptability as it will avoid the complications of RSGA even in category-1 CS. The concept of RSSA was introduced by Kinsella et al. for category-1 caesarean section. The steps of RSSA include the use of no-touch technique for spinal needle insertion, simplify the spinal drug combination, limit the time available for attempts, if necessary, start the surgery before full establishment of the block, and be ready to administer general anesthesia in the event of spinal failure. In this study, the changes that were carried out were a predesigned spinal anesthesia kit for quick use; a waiting, masked, gowned, and gloved anesthesiologist while patients were wheeled in the OT; and a 15° head down tilt was allowed after the spinal block to achieve higher level of block rapidly. Kinsella et al. did not mention the position of the patient during administration of SA. In their original case series, among 25 patients, positions used for administration of spinal block were left lateral, right lateral, and sitting in 17, 7, and 1 patient, respectively. In obese patients, gravity of the lateral position itself can drag down the pad of the fat obscuring the midline. Identification of space is easier in a sitting position. Hence, RSSA was performed in sitting position. Asepsis was maintained by single wipe of 0.5% chlorhexidine solution, which was adequate according to the earlier studies., In the present study, blinding was not possible because of technical differences between the groups. Both time for anesthesia (144.80 ± 3.42 s with RSGA vs. 131.20 ± 3.40 s with RSSA; P < 0.001) and time to surgical readiness (178.76 ± 4.09 s with RSGA vs. 169.93 ± 3.08 s with RSSA; P < 0.001) were significantly less with RSSA in the present study. The time required for performing RSSA was even shorter than the original finding of Kinsella et al. and other similar type of studies., This is probably because of the modifications that were made in the RSSA technique in the present study. Incision to delivery time (181.73 ± 6.87 s with RSGA vs. 178.26 ± 9.31 s with RSSA; P = 0.107) was comparable between both the groups in the present study, and it is consistent with the finding of others. It indicates that duration of surgical procedure itself does not depend on the anesthetic technique. The emergence time (512.13 ± 34.33 s with RSGA vs. 222.10 ± 12.80 s with RSSA, P < 0.001) was much shorter with RSSA, and this was also similar to earlier studies. Apgar score of the baby at 5 min (7.03 ± 1.99 s with RSGA vs. 7.40 ± 1.83 s with RSSA; P = 0.461) was comparable between both the groups, and it was consistent with the finding of other investigators. Apgar score recorded at 1 min may falsely show a depressed baby after RSGA as most of the anesthetic drugs are lipid soluble and readily cross the placental barrier and may influence the assessment of Apgar score. Hence, we compared the score at 5 min after the initial resuscitation done by the pediatrician. A retrospective analysis concluded that the 5-min Apgar score remained a valid predictor of neonatal mortality, however, using it to predict long-term outcome was inappropriate. Low Apgar scores at 5 min are associated with death or cerebral palsy, and this association increased if both 1 and 5-min scores were low. There are some limitations of our study. Performance of all RSSA procedures by the same anesthesiologist may be a limitation as the same time period may not be reproduced by other anesthesiologists. Cord blood pH and lactate were not measured due to lack of facility. In conclusion, anesthesia delivery time (the time interval between time for anesthesia to delivery of the baby) is shorter if rapid sequence spinal anesthesia is administered as described for category 1 CS as compared to rapid sequence general anesthesia and this technique should be a viable option in such surgeries. Lumbiganon P, Laopaiboon M, Gülmezoglu AM, Souza JP, Taneepanichskul S, Ruyan P, et al. Method of delivery and pregnancy outcomes in Asia: The WHO global survey on maternal and perinatal health 2007–08. Lancet 2010;375:490-9. Lucas DN1, Yentis SM, Kinsella SM, Holdcroft A, May AE, Wee M, et al. Urgency of caesarean section: A new classification. J R Soc Med 2000;93:346-50. National Institute of Health and Clinical Excellence. Caesarean section: Clinical Guideline, CG13: Caesarean section; 2004. Availablefrom: http://www.nice.org.uk/nicemedia/pdf/CG013NICEguideline.pdf. [Last accessed on 2015 Apr 10]. Kinsella SM, Walton B, Sashidharan R, Draycott T. Category-1 caesarean section: A survey of anaesthetic and peri-operative management in the UK. Anaesthesia 2010;65:362-8. El-Orbany M, Connolly LA. Rapid sequence induction and intubation: Current controversy. Anesth Analg 2010;110:1318-25. Kinsella SM, Girgirah K, Scrutton MJ. Rapid sequence spinal for category-1 urgency caesarean section: A case series. Anaesthesia 2010;65:664-9. Scrutton M, Kinsella M. Obstetrics. In: Allman KG, McIndoe AK, Wilson IH, editors. Emergencies in Anaesthesia, 2nd ed. Oxford: Oxford University Press; 2009. p. 145-78. Apgar V, Holaday DA, James LS, Weisbort IM, Berrin C. Evaluation of the new born infant; second report. JAMA 1958;168:195-8. Kathirgamanathan A, Douglas MJ, Tyler J, Saran S, Gunka V, Preston R, et al. Speed of spinal vs general anaesthesia for category-1 caesarean section: A simulation and clinical observation-based study. 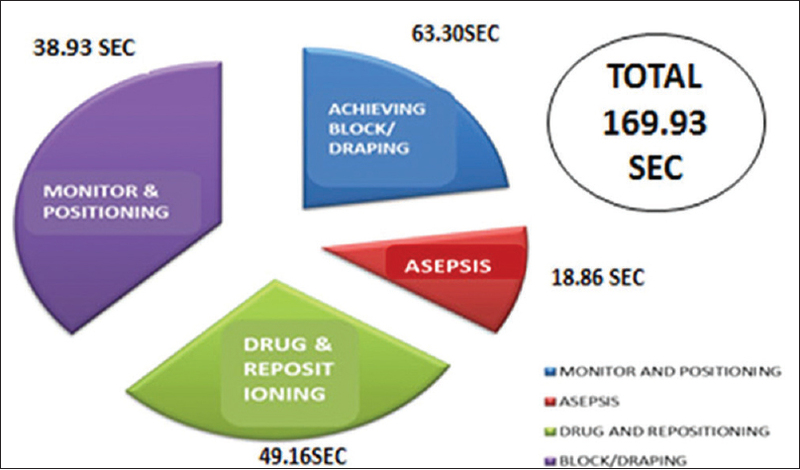 Anaesthesia 2013;68:753-9. Páez L, Jairo J, Navarro V, Ricardo J. Regional versus general anesthesia for cesarean section delivery. Rev Colomb Anestesiol 2012;40:203-6. Lansbury A, Lyons G. Time taken to perform spinal anaesthesia in emergency caesarean section. Int J Obstet Anesth 2002;(suppl 1):12. Gebremedhn EG, Gebeyehu KD, Ayana HA, Oumer KE, Ayalew HN. Techniques of rapid sequence induction and intubation at a university teaching hospital. World J Emerg Med 2014;5:107-11. Health Quality Information Partnership. WhyMothers Die 2000-02. Report on confidential enquiries into maternal deaths in the United Kingdom. London: Royal College of Obstetricians and Gynaecologists 2004. Available from: http://www.hqip.org.uk/assets/NCAPOP-Library/CMACE-Reports/32.-November-2004-Why-Mothers-Die-2000-2002-The-Sixth-Report-of-the-Confidential-Enquiries-into-Maternal-Deaths-in-the-United-Kingdom-Executive-Summary.pdf. [Last accessed on 2015 May 26]. Beckmann M, Calderbank S. Mode of anaesthetic for category 1 caesarean sections and neonatal outcomes. Aust N Z J Obstet Gynaecol 2012;52:316-20. Tuffnell DJ, Wilkinson K, Beresford N. Interval between decision and delivery by caesarean section – are current standards achievable? BMJ 2001;322:1330-3. Saravanakumar K, Rao SG, Cooper GM. Obesity and obstetric anaesthesia. Anaesthesia 2006;61:36-48. Scrutton M, Kinsella SM. The immediate caesarean section: Rapid-sequence spinal and risk of infection. Int J Obstet Anesth 2003;12:143-4. Malhotra S, Dharmadasa A, Philip S, Jepson A, Siegmuller C, Yentis SM. One versus two application of chlorhexidine/ethanol for skin disinfection before regional anaesthesia. Int J Obstet Anesth 2010;19:s10. Ismail S, Huda A. An observational study of anaesthesia and surgical time in elective caesarean section: Spinal compared with general anaesthesia. Int J Obstet Anesth 2009;18:352-5. Levy DM. Emergency Caesarean section: Best practice. Anaesthesia 2006;61:786-91. Casey BM, McIntire DD, Leveno KJ. The continuing value of the Apgar score for the assessment of newborn infants. N Engl J Med 2001;344:467-71. Moster D, Lie RT, Irgens LM, Bjerkedal T, Markestad T. The association of Apgar score with subsequent death and cerebral palsy: A population-based study in term infants. J Pediatr 2001;138:798-803.